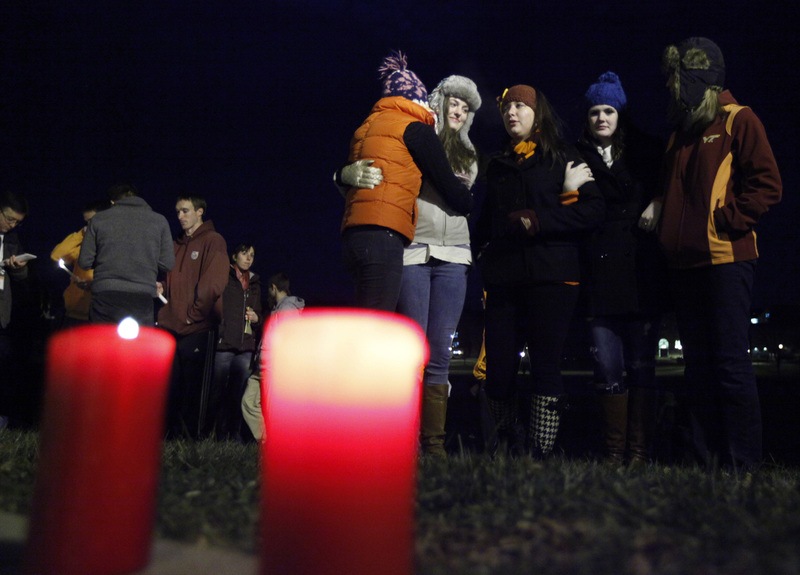 BLACKSBURG, Va. - About 150 students gathered silently Thursday night in an impromptu candlelight vigil at Virginia Tech, after a police officer was gunned down and the shooter apparently killed himself on campus. The students showed up Thursday night on a field facing the stone plaza memorial for the victims of the 2007 massacre in which 33 people were killed - the deadliest mass shooting in modern U.S. history. Though the official candlelight vigil was moved to Friday evening, many turned out anyway to show their support for the officer who lost his life. Police said a gunman fled after walking up to campus police officer Deriek W. Crouse, who was involved in a routine traffic stop on the campus, and fatally shooting him. Police believe the gunman was the person who later was found dead at what officials had been calling a second crime scene. Authorities are still trying to piece together a motive for the attack and don't know of any links between Crouse, an Army veteran and father of five, and the suspect, who remains unidentified. The shooting prompted officials to put the campus on lockdown, which lasted four hours while students and staffers alike wondered and worried about what was going on. "It was just kind of like an eerie kind of aura around campus," said one student, "because it was just quiet and that's not what you get on a weekday." The 2007 shootings at Virginia Tech prompted the school to create an alert system using text messages and Internet announcements to warn students of danger. That alert system was used in 2008, when someone reported sounds that resembled gunfire near a dorm. CBS News correspondent Sharyl Attkissonreports that the 2007 tragedy was on the minds of everyone here, especially those who made it out. "Your heart just kind of drops," Frederick Cook, a graduate of Virginia Tech, told CBS News. "It's like a pretty intense, emotional thing." Cook was an engineering student in 2007 when Seung-Hui Cho went on a shooting spree. Cook survived, but 32 others and the gunman didn't. "My life has changed dramatically since the shooting. There isn't a day that goes by that I didn't think about what happened there," Cook said. Those painful memories rushed back as Cook anxiously followed Thursday's event from his downtown office in Blacksburg, just blocks away from campus. Michelle Robinson's sister was attending here the first time lightning struck; now she's a student herself. Despite the criticisms following the slow response last time, she feels the campus got it right this time. "If it was to happen anywhere, Tech is the safest place to be," Robinson said. Attkisson says that reports from all around say communications were better and stronger this time, thanks to the systems put in place after 2007. "Lightning is not supposed to strike twice," Virginia Tech professor and poet Nikki Giovanni told CBS News. "It's just incredibly sad."